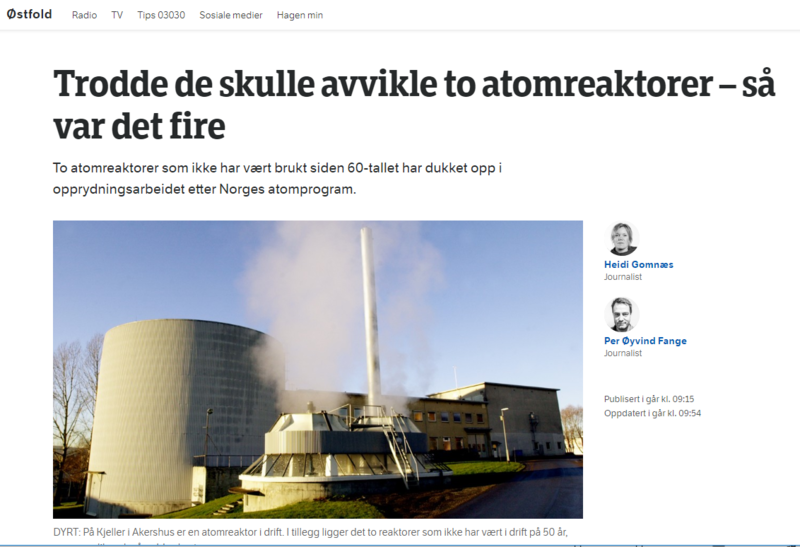 The news headlines in Norwegian media about “IFE finds two nuclear reactors at Kjeller” and “They thought they were decommissioning two – then there were four” have resulted in a series of misleading news stories and sparked many reactions and comments in social media. The media presentation of the story gives a misleading picture of what this is about, and the headlines give the impression that IFE did not know about the two historic reactors JEEP I and Nora. This is of course wrong. At IFE we are well acquainted with the reactors JEEP I and Nora. However, these two historic reactors have been described as “decommissioned” in our own and the government’s documentation. Now that the work related to decommissioning of the Halden Reactor and historic nuclear fuels storage has begun, IFE would like to emphasize that JEEP I and Nora are not completely decommissioned according to today’s standards and requirements. The plants were closed down and put in a safe condition in the 1960s. But a lot of the reactors remain intact. Today’s standards require the plants to be completely removed. A complete decommissioning of these facilities must therefore also be included in the total cost estimates. The cost of this has not been taken into account in the public analysis and cost estimates related to decommissioning of Norway’s nuclear installations from 2016, conducted by external consultants. Thus, the clean-up will be even more comprehensive and complex than the first investigations considered.